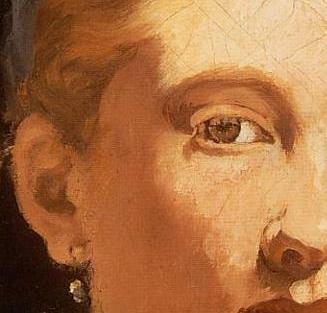 Victorine Meurent is best known as Manet’s famous model, but she was also an artist. She exhibited work at the Académie des Beaux-Arts, but the only painting of hers that is known to exist today is the work above, Le jour des rameaux, or Palm Sunday. That simple paragraph might not seem to contain revolutionary ideas, but it does. Victorine Meurent was a working class woman and an artist in the 19th century. I think one of the biggest obstacles I faced in writing Paris Red is the label “working class.” I often see people use that phrase to turn varied lives into lives of sameness. “Working class” is also often used to imply hopelessness, narrow horizons, and a lack of dreams. Yet working class people today aren’t without imagination, keen intelligence, and choices, and they didn’t lack those things in the 1860s in Paris, either. When I wrote Paris Red, I wanted to destroy the presumptions the words “working class” create, and get at the emotional and artistic truth of Victorine Meurent. Reblogged this on Sergey Gusev's Visual Art. Previous Post Photos of Victorine?